Hundreds of war protestors took to the streets in San Francisco today and my CNN crew and I became part of the story, albeit briefly. It happened as we were videotaping a group of about 50 protestors lying down on Market Street, one of the busiest and most well-known streets in downtown San Francisco. Police, understandably, wanted to clear the street to allow traffic to pass. They shouted an order for the group to disperse and said they’d arrest anyone who didn’t immediately leave. Apparently, that meant reporters, photographers and producers as well. We were stunned when we realized that we were being lumped in with the protestors; the officers wouldn’t let us leave. It’s a bit disconcerting to be held against your will and threatened with arrest, especially when doing your job. We had credentials, cameras, and microphones. It was clear who we were; about six other journalists were in the same boat. After about 20 minutes or so, our CNN attorney was on the case, speaking with the police. They let us go with basically a warning. 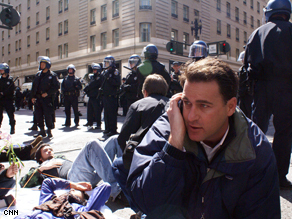 Police have a tough to job to do, especially controlling a crowd of anti-war activists. Some of the protesters threw water balloons filled with fake blood. Others chained themselves to businesses they called “war profiteers.” Police had every right to arrest those people and those who were blocking a street. We were doing OUR job by watching them do THEIRS. Bottom line – I think I’ll be a lot more careful where I’m standing next time I’m covering a protest. How do you get to Fayetteville? Catching my breath for the first time today... it's finally setting in that I'm on a campaign plane with the press (sitting next to Annie Leibovitz no less) following Sen. Obama around North Carolina today. It all started LATE last night a little before show time. I'm an editorial producer for 360° which involves booking guests for the show as well as coordinating the interviews – sounds simple when you put it that way, but in reality it always ends up being an adventure. Top interviews, such as Sen. Obama can take months – or even years – to set up depending on the nature of the interview you're trying to get. 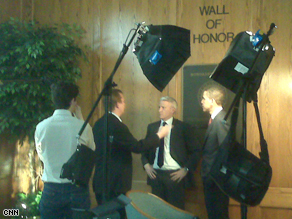 I've been working on setting up a behind-the-scenes day with Sen. Obama for a LONG time now. So when Sen. Obama's press person called us last night to invite us to join them today on the trail we jumped at the chance. But then we realized mid-jump that we had to get to Fayetteville, N.C., by 10am for Sen. Obama's first event – NOT the most accessible place to get to last minute. After a few hours of resourcefulness on the part of our Unit Coordinator, and a few hours of sleep for us, we're here – and will be bringing you some fun behind the scenes moments that people rarely see... as well as a fabulous sit-down interview Anderson just conducted with Senator Obama on the trail today. Oops, we're in our "final descent into the Charlotte area" – see you tonight in Charlotte! Sorry for the delay, its been a busy day on the 360blog... but I didn't forget! It's time for 'Beat 360°.' Everyday we post a picture – and you provide the caption. Our staff will get in on the action too. President Bush marked the fifth anniversary of the Iraq war on Wednesday by calling the debate over the conflict "understandable" but insisting that a continued U.S. presence there is crucial. More than 7 out of 10 Americans think government spending on the war in Iraq is partly responsible for the economic troubles in the United States, according to results of a recent poll. Hundreds flee killer floods in central U.S. Flooding forced hundreds of people to flee their homes and closed scores of roads Wednesday across the nation's midsection as a storm system poured as much as a foot of rain on the region. Two Florida state senators presented a plan Wednesday to seat the state's delegates at the Democratic National Convention, hoping that Sens. Hillary Clinton and Barack Obama will embrace their compromise. 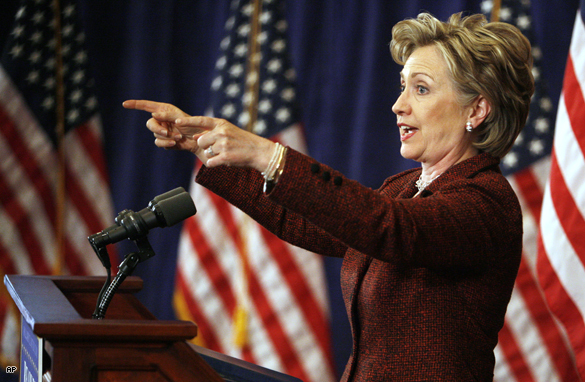 The National Archives has released more than 11,000 pages of Sen. Hillary Clinton's schedule when she was first lady. North Carolina Governor Mike Easley is offering a $10,000 reward for more information in the shooting death of a UNC student body president Eve Carson. The band manager whose pyrotechnics display sparked a nightclub fire that killed 100 people in 2003 was freed from prison Wednesday after serving less than half of his four-year sentence. Screaming sports coaches and cutthroat tycoons have it wrong: Nice guys do finish first, a new study suggests. Apparently Eliot Spitzer's good-time gal already had her 15 minutes. I just finished interviewing Senator Obama, we talked at length about lingering questions surrounding Reverend Wright, as well as how he thinks the controversy has hurt him. “...And if I bring something to this conversation, it's gonna be because I do what I did yesterday, which is hopefully open up new conversation about a new direction of the country. As a practical matter in terms of– how this plays out demographically, I can't tell you. I don't know. " I'd blog more but our plane is just taking off, we're heading to Charlotte...see you from there tonight. On the trail... with Clinton? We've been getting a bunch of e-mails from viewers asking why I haven't gone out on the trail with Senator Clinton. They say its unfair of us, that we are not giving equal time to senator clinton. Well, I'd love to join Senator Clinton on the campaign trail. We've requested it numerous times, and so far, nada. So feel free to direct your e-mails to Senator Clinton's campaign. As you've probably seen, Anderson is on the trail with Sen. Barack Obama today. This time his trail takes the show to Charlotte, North Carolina. Specifically, we'll be on the campus of University of North Carolina at Charlotte. It is helping to generate more interest in the actual candidates and issues. There’s a heightened interest on the issue of the economy and on the issue of Iraq, on a day that marks the 5th anniversary since the war began. I'm anxious to see if this materializes into big numbers among the "youth vote" in November. Anderson will hit these issues and many more during his interview with Sen. Obama. Tune in tonight as we are live on the beautiful campus of UNC Charlotte. The 49rs are ready for Anderson!! Program Note: Watch Anderson's report from North Carolina , on the campaign trail with Barack Obama, tonight on 360° 10p ET. She doesn’t drive more than two miles from home. She’s afraid her minivan is going to hit a roadside bomb. She has thoughts of suicide, nightmares about body parts falling on top of her, and sometimes can’t even remember her home phone number. Veteran Keri Christensen was nearly a victim of a roadside bombing in Iraq when the convoy in front of hers was hit. Here's a preview of her interview with Randi Kaye. I first interviewed Keri in November 2006. She was part of history then, among the first group of women in the history of the United States classified as combat veterans. Female troops technically are only allowed to do “combat support” but women are seeing violence like never before, and it’s leaving them with battle scars, both inside and out. Keri was diagnosed with Post Traumatic Stress Disorder, or PTSD, before she left the war zone. She’s been home now two and half years and is still struggling. Last fall, she hit rock bottom. Again, she thought about killing herself after another panic attack. Keri is married with two little girls, Madison and Olivia. She says her kids know she’s not the same “mommy” she was when she left for war. They know she’s going to counseling once a week and also group therapy. She’s taking all kinds of pills for her nightmares, PTSD, anxiety and depression. We are with Senator Barack Obama on the campaign trail in North Carolina today. As we all know, it's been a tough week for Obama, and after yesterday's speech on race he is hoping to turn the focus to Iraq. Lingering questions remain about Sen. Obama's relationship with the controversial Rev. Jeremiah Wright, and we'll talk with him about those questions, as well as Iraq, the economy, and the campaign. On a personal note, I've been off for the last couple of days. I had minor surgery on Monday. A small spot of skin cancer was removed from under my left eye. I hadn't planned on mentioning this, but I still have stitches and you'll no doubt notice them tonight. Don't want you to think I got into a fist fight with Charlie Rose.